Son of Darius, King of Persia (485-465 B.C.). His name, which is Khshayarsha in Persian, Ikhshiyarshu (with variants) in Babylonian, and Ξέρξης in Greek, frequently occurs, in the Old Testament. It is often written with ו instead of י, as in the Masoretic text, where it is spelled (Aḥashwerôsh) instead of (Ayḥashyarsh), with the prothetic vowel indispensable in Semitic before initial double consonants. 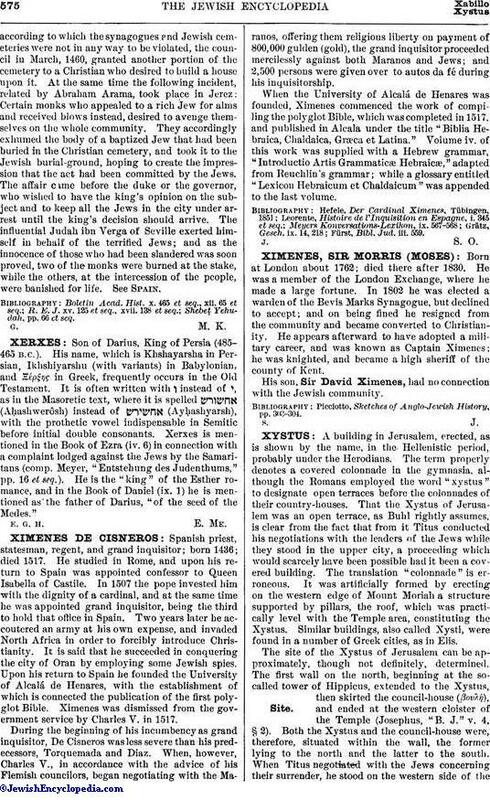 Xerxes is mentioned in the Book of Ezra (iv. 6) in connection with a complaint lodged against the Jews by the Samaritans (comp. Meyer, "Entstehung des Judenthums," pp. 16 et seq.). He is the "king" of the Esther romance, and in the Book of Daniel (ix. 1) he is mentioned as the father of Darius, "of the seed of the Medes." E. G. H. E. Me.